17/3/11 – Acquisitions – Dallas, Museum of Art – Oliver Meslay left the Louvre almost two years ago to take over as curator at the Dallas Museum of Art, in charge of European and American art. Several works have been acquired since he arrived. The following are the most important ones. 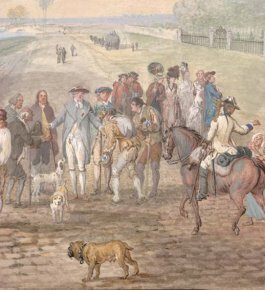 Louis-Nicolas and Henri-Joseph de Blarenberghe, A Volunteer Enrolls in the Penthièvre Regiment in the Presence of the Duke of Penthièvre and Benjamin Franklin, in front of the Château de Rambouillet (ill. 1). Henri-Joseph was the son of Louis-Nicolas Van Blarenberghe and worked in a style very similar to his father’s. The gouache watercolour acquired here by Dallas is a collaboration between the two artists. It was identified, after being purchased through Christie’s, as a scene showing the enrollment in the Penthièvre regiment in front of the château in Compiègne . 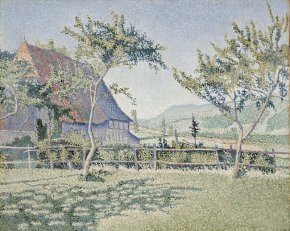 Paul Signac, Comblat-le-Château, the Meadow (ill. 2). In June 1887, Signac was in Comblat-le-Château in Auvergne where he painted this canvas acquired by the museum from a private collection through Sotheby’s. 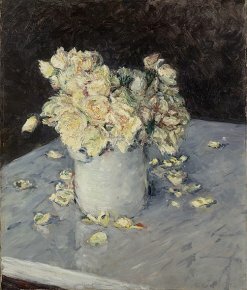 Gustave Caillebotte, Yellow Roses in a Vase (ill. 3). This beautiful still-life in a style close to that of Edouard Manet was once part of Degas’ private collection, acquired when Caillebotte died. The Dallas museum purchased it at Noortman’s in Amsterdam. Edouard Vuillard, Chestnut Trees or The Stained Glass Window (ill. 4). 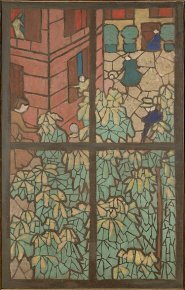 This distemper painting is a cartoon for a stained glass window for the series commissioned by Samuel Bing from eleven French painters to be executed by Tiffany Glass and Decorating Company and exhibited at the Salon de la Société nationale des beaux-arts of Paris in 1895. Along with Vuillard, the other cartoons were by Albert Besnard, Pierre Bonnard, Maurice Denis, Henri-Gabriel Ibels, P. A. Isaac, Paul Ranson, Ker-Xavier Roussel, Paul Sérusier, Henri de Toulouse-Lautrec and Félix Vallotton. Only three of these are known today, including the one by Tolouse-Lautrec=0&tx_damzoom_pi1[xmlId]=001404&tx_damzoom_pi1[back]=fr%2Fcollections%2Fcatalogue-des-oeuvres%2Fresultat-collection.html%3Fno_cache%3D1%26zsz%3D9]at the Musée d’Orsay. This painting, acquired from a private collection through the Bernheim Jeune Gallery and Christie’s, joins an already rich ensemble of Vuillard works. 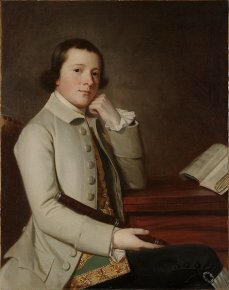 We would also like to point out that a painting which had remained in storage until now and attributed to the American artist, Ralph Earl (ill. 5) has been acknowledged as being by George Romney. This identification, suggested by Piers Davies, was confirmed by Alex Kidson, a specialist of this artist. This represents still another way for a museum to enrich its collections. This identification was confirmed and explained by Jean-Marie Haussadis, as well as by General Michel Hanotaux, president of Sabretache.